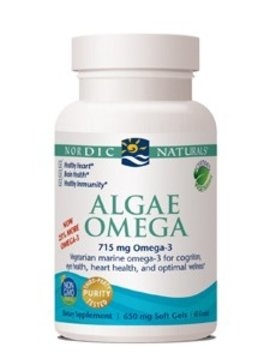 Algae Omega is a vegetarian source of omega-3, and offers a unique combination of EPA and DHA without the use of fish. Every batch of Nordic Naturals algae oil is tested by a third party certified lab for environmental toxins, including heavy metals. All algae oils are in the triglyceride form and surpass the stirctest international standards for purity and freshness. Suggested Use: Two softgels daily, with food, or as directed by your health care professional or pharmacist.